Another old cookie lady, Rynah Noran, needed Jolyne’s help but this time it was not to clean thankfully enough. No, this time it seemed like something else would happen as Jolyne Atreides passed the usually cat piss stinking(so they cook meth here, seriously guys it’s either years and hundreds of cats or like an hour of cooking meth. Source: Midwest Living) it now smelled like fresh baked cookies, a much more pleasant aroma. The old lady named early was sitting out on a bench in front of one of the many doors that dotted the building next to a small garden. She was drinking tea that steam billowed out of on this crisp winter morning. After she noticed Jolyne she called her over and immediately introduced herself, they both began talking to each other about small things afterwards before the woman launched into her point. By now both ladies were inside Rynah Noran’s house which was cozy while not being too small and filled to the brim with knick knacks. It seemed as though the old woman enjoyed owls and cats the most as most of the decorations there were adorned with them in some way. A clock that was an owl stared at two kitten bookends across the room for example and those bookends held books of varying degrees within. There was a full case next to the couch that they sat upon in a room that coupled as a living room and kitchen. By now Jolyne had accepted an offer for tea and was now drinking along with the other woman who was seated opposite of her on a huge plush chair that was modeled after the fattest, sassiest cat Jolyne could imagine. Now though the old woman broke down as she went into her tale of woe about her child that had left her, she spoke of how close they were before he became estranged and while she did not immediately go into the cause Jolyne could feel Rynah’s pain as she explained the situation to her. This was followed up by asking Jolyne help her write a letter in order to sway her child to not send her to a retirement home, Jolyne had no choice but to obligate the woman. They spent the next hour recounting tales of his childhood into the letter the old lady pouring out her soul to Jolyne, and thusly Jolyne pouring those onto a page in the hope that their efforts would bear fruit. The mere thought of discarding a parent in such a way left an extremely bitter taset in Jolyne’s mouth. She was now worried that perhaps she would not enter into this man’s bar with the best mind state and may end up ruining the situation. 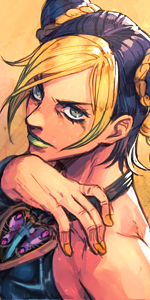 Jolyne knew then that she must keep her anger about the situation under control and do her best not to tie it to the personal wounds that she bore about her own parents and their death. It would be hard but Jolyne knew she could do it. Perhaps Jolyne had been too harsh in her first assessment of the man, now she saw a man wrapped up in trying to sort his way through his own struggles in life break down in front of her. The man wept openly as he read the letter that he had snatched so quickly from Jolyne’s hands as soon as she mentioned it was from his mother. Perhaps she had been not understanding enough of the obstacles that life enjoyed throwing in everyone’s way. Either way as soon as he finished the letter Mitya Noran rushed past her and went in the direction she had come from. It seemed that the owner of this bar had a soft spot after all even though he spent most of his time harassing the establishment opposite of him on the street. This was perhaps a very good lesson not to judge a book by it’s first paragraph Jolyne thought to herself with a genuine smile that brought warmth to her heart as she turned and went to go follow Mitya. Returning down her path and coming towards the Apartments once again Jolyne came upon the sight of the two people embraced in a water logged cry soaked hug. She had come upon the two getting back together seemingly after a while as both were extremely emotional. This warmed her heart even further as she so rarely was able to bear witness to the happy moments of life, it was nice to just bask in the joy of others for a bit. It was one of life’s simple pleasures in Jolyne’s mind and so she hung back as they began to talk only approaching after they had a while to get each other up to speed on their lives with each other. It had seemed that Mitya had wanted to move Rynah out of the horrible Apartments that she was currently living in, he believed, and Jolyne agreed, that the place was unsuitable conditions for someone to dwell in. After all from her experiences so far it was very clear the person who was Land Lord or Lady of this place did not care enough about it. While Jolyne believed this meant it should be revoked from her, she also realized such thoughts were rather radical in the overall scheme of things. This was refuted by the mother however who insisted she enjoyed the community of elderly ladies there and that they had banded together to effectively take over the building. They were now doing an upkeep and acting as the unofficial owners, Jolyne had to admit that it looked and smelled a lot nicer than the first time she visited. Still the Magician was not fully convinced but it was not her place to decided or even offer an opinion in this case and so she bid the both of them goodbye. Mitya rewarded her and Rynah gave Jolyne some cookies, which the woman then devoured quite quickly. No matter how long she lived in this new country she would always carry her food habits it seemed.